If companies make any significant announcements about their investments, they’re required to notify the appropriate government watchdogs, which in most cases is the Securities and Exchange Commission. Point your web browser to the Securities Exchange Commission. The SEC site makes an appearance. 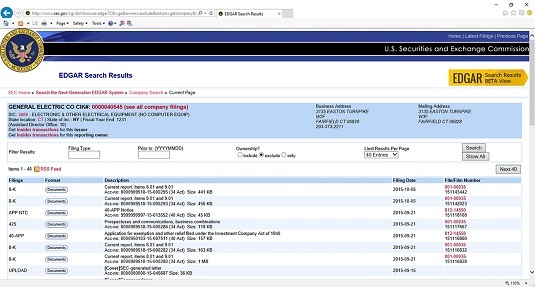 Hover your mouse over the Filings tab and choose the Company Filings Search link. The Search the EDGAR Database page appears. Enter the company’s name or ticker symbol into the appropriate box, and then click the Search button. You see a giant list of company filings in the order they were filed. It’s an intimidating list that’s hardly user-friendly because the forms are distinguished only by their form, which is regulatory code for the types of information the documents contain. This table gives you the skinny on what the various form codes mean. All the form codes aren’t included because there are so many. Several of the form codes are for documents you don’t need to worry about or for data you can get more easily elsewhere, including when officers of the company sell stock. The SEC website provides regulatory filings to investors at no cost. 8-K A news flash from the company. 8-Ks can contain just about anything that’s considered “material” or important to investors, ranging from the resignation of a top official to news of the win of a new customer. 10-Q The company’s quarterly report. This form displays all the information a company is required to provide to investors each quarter. Here you can find the key financial statements, such as the income statement and balance sheet, which are covered in more detail in Book 7. 10-K The company’s year-end report. This is one of the most important documents a company creates. It gives you a summary of everything that happened during the year, including comments from management and financial statements that have been checked, or audited, by the company’s accounting firm. DEF 14 and DEF 14A The company’s proxy statement — a document that describes company matters to be discussed and voted on by shareholders at the annual meeting. Contains all the important company information that’s subject to shareholder approval and scrutiny. Most proxies contain everything that’s up for a vote at the shareholder meeting, including board members up for election, pay packages and other perks, and pending lawsuits. If you’re going to read any document, make it this one. Footnoted.org is a business blog that studies proxies and pinpoints things that smell fishy. The Analyst’s Accounting Observer is published by well-known accounting watchdog Jack Ciesielski, who is trained to find suspicious things in company filings. Major mainstream media also pick the proxy statements apart and find things that stand out. USA TODAY, for example, routinely analyzes proxy statements, looking for details about CEO compensation.